We, therefore, had to make sure that any work which took place was under the supervision of an experienced structural engineer. It was our job to make sure that any building work was completed under the building regulations, but more importantly that it was able to withstand any stress imposed by the environment and the daily use of our client living in the property. As part of this home renovation, Sigma Construction worked with a number of proffesionals including an engineer, an architect, and an interior designer. Working with such professionals meant that all visual and structural needs were met. The design process began with the property being surveyed, and the client’s vision discussed prior to any work being begun. The next stage involved the interior designer proposing layout drawings and ensuring that the client’s vision and needs were met. The designs showed the different layout options that could be achieved within the space they had available. These designs included floor plans and mood boards, along with any relevant samples. In order to ensure that our clients were satisfied, a selection of finishes were shown to them prior to choosing any flooring, kitchen units, or flooring. This allowed them to our proposed design in the best possible light. The mood boards allow clients to envision what the end result will look like. 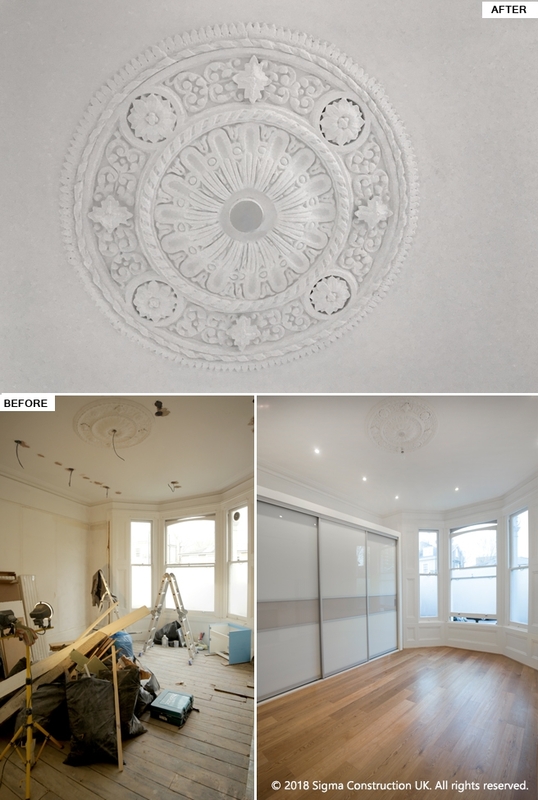 As part of this Maida Vale home renovation, our interior designer and architect had to take various factors into consideration, such as rewiring the lights, which itself lead to restoring an existing ceiling rose that the client wanted to keep. This meant we had to make sure that any lighting design worked with the existing ceiling rose. Another element that our interior designer and architect had to take into consideration was for new bedroom wardrobes, which worked well within the space, allowing the client to have the best storage solution while maximizing the space and making it aesthetically pleasing. Our designer proposed bespoke, built-in sliding wardrobe, as this was the best solution within the space. As part of this refurbishment, we proposed that our client opted for an open-plan layout, which we felt was the best solution to opening up the property and making it feel as spacious as possible. This meant we had to disassemble the flat prior to our contractors beginning any work, in order for them to have an empty space to work with. The process began with the demolition of the bearing wall dividing the kitchen and living area, thus opening them up. We then renovated the windows, making sure they were properly insulated. The new layout proposed by our interior designer and architect ensured that the W9 flat would instantly appear more spacious, and provide our client with a pleasant, yet comfortable, living space. Sigma Construction UK prides itself on always completing any job we undertake to the highest quality, and this job was no different. 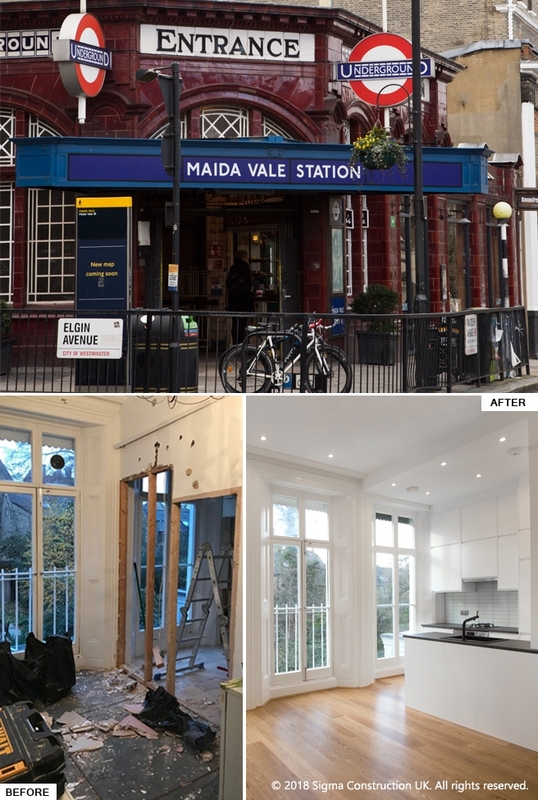 Our builders take pride in their work: as part of this Maida Vale house renovation, they made sure that all the walls were fully prepared, plastered and primed prior to any painting work, meaning the client was left with a beautifully finished interior, which can be seen in the photos. Our client’s principal aim was to utilize the space as effectively as possible, and with the help of our professional team of an engineer, an interior designer, an architect and builders we were able to achieve just that. This demonstrates how our team at Sigma Construction UK always go out of their way to make sure we meet our clients’ needs to the very best of our ability by exploring any possible route we can take. For example, in this particular Maida Vale house renovation, determining walls that could be demolished meant that our client was left with as much space as possible. The client wanted to replace the bathroom with a wet room, once again to maximize the space, but without over-complicating the process. We proposed beautiful taupe-coloured stone tiles, with accents of white, rather than tiling the entire wet room in an old-fashioned way. The design introduced a painted finish on the wall where the window and sink were placed. This worked well as it not only added a fresh and bright element, but also created a nice contrast with the tiles. 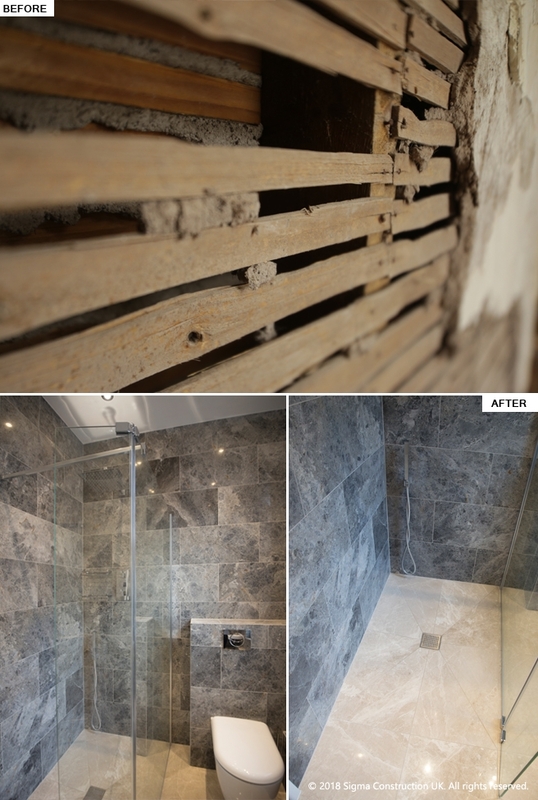 As part of the layout we had changed the existing bath into a shower which visually instantly gave the bathroom a bigger and more spacious feel. To maximize the space even further we installed a wall-hung minimal sink and added storage in the mirror cabinet above it. This is a great storage alternative to anyone who is working with a small bathroom yet wants to allow for some storage. In the living room, our clients were keen on keeping the entire space white and fresh: this worked very well within their W9 flat, owing to the beautiful earthy tones and views outside the large window. We had proposed that they kept the walls light, yet add color with furniture and accessories to dress the property. We believe our builders did a fantastic job of refreshing the walls with paint, instantly giving the property a new look. In order to make the best use of the alcoves which were already part of the living room structure, we designed a bespoke storage unit giving our client a display shelf which can be used for displaying accessories, and incidentally adding more character. The overall space is bright and minimal, and to add a bit more interest and contrast we opted for a beautiful oak floor, which we installed with underfloor heating. To keep within the minimal yet contemporary look the client wanted to achieve, we kept the kitchen simple, yet functional. We wanted our client to be left with substantial worktop space allowing plenty of room for cooking and food preparation, making everyday life easier. Sigma Construction UK is aware that whilst our clients want to achieve the most aesthetically pleasing finish, in the end, functionality is key to any design we propose. Part of any good construction and design is lighting, which plays a very important part in any design. We wanted the kitchen to be well lit. To give the client the option of task or mood lighting, we placed additional wall-mounted lights underneath the units, giving the kitchen a more decorative finish; this is also practical when you don't want the main lights on. 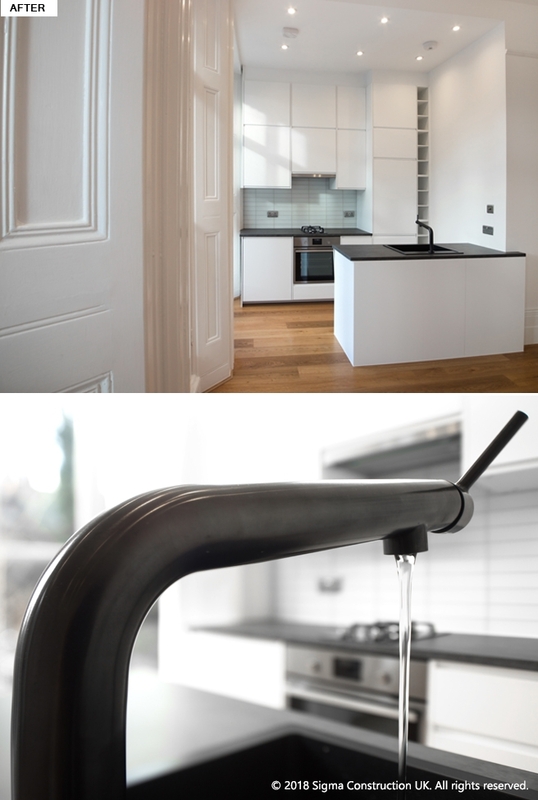 The kitchen design was once again minimal; we decided on black and white to maintain a minimal design throughout the W9 flat. In order to unify the space, we decided to keep the flooring consistent throughout the proposed open plan. White gloss contrasts beautifully with the black stone worktop;and the matt and gloss work well together, contrasting not only in colour but also finish, whilst the consistency of the flooring give the space an even design flow. 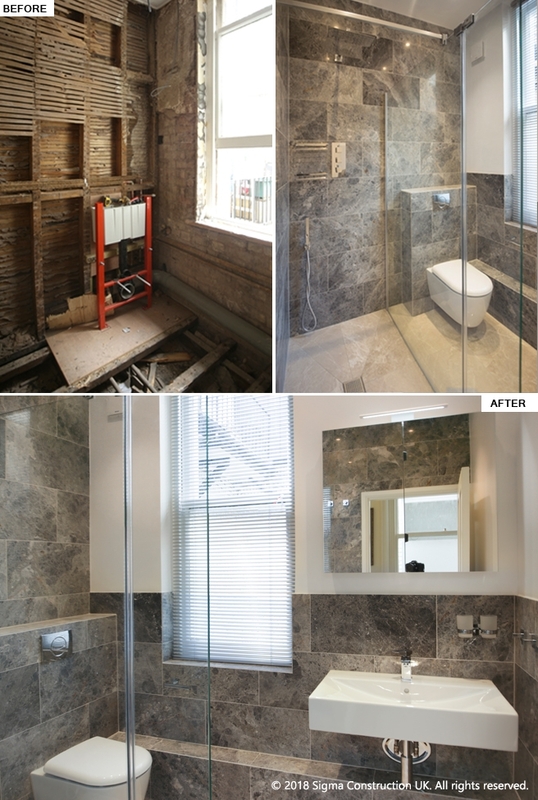 This Maida Vale house renovation is yet another successful project for our team at Sigma Construction. 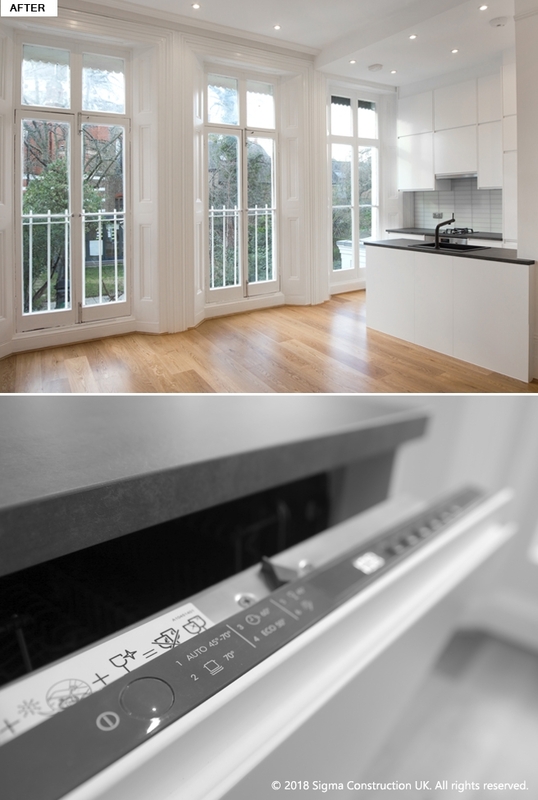 The beautiful surroundings and natural light in the property meant we were left with a bright and spacious design, with dark elements, seen throughout the property which all nicely complemented one another, giving the flat an elegant, contemporary look.